Most friends of mine will be able to attest to my dislike of highways. You can tell when I ask for surface street directions even if you are quite a ways away. But, then I bought my house in the northwest section of Las Vegas about 2 years ago. For about a year, I would still take surface streets to work. I changed to an earlier shift and decided to attempt using US 95 and Interstate 15. I was pretty shocked at how easy it was. I still had my fear of traffic and have actually been late to work a few more times than when I lived less than 5 miles from work. Roadwork has been a major concern in Las Vegas and I've even started watching the news on TV before heading out just for any extra information about tie-ups. All good... yet, I have now developed an attitude on the road. 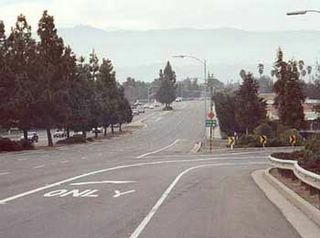 From the picture you see posted, you can see there is a lane on the far right that is for cars that break down or bicyclists. I absolutely lose it when people decide that they are too important to follow the flow of traffic and stay in real lanes. I was in heavy traffic a few days ago and we were at a literal crawl. Some brain surgeons decided to use the breakdown/bicycle lane and then push their way back in line further ahead. After 15 minutes of this, I decided to straddle the lane which kept both lanes from progressing and received a lot of honking from the people who do not know what patience is. Further up the road there were signs in that lane much to my delight. But I wonder, why do we let these idiots back in the regular lane after they just passed everyone that was being patient? I get mocked for not wanting to drive on the highway. "It's just straight." they mock, "it's easier than driving in the city." Bah! I say to you, bah! I try to avoid the highway as much as I can. I even tense up at times when I am a passenger. It always seems that the person I am in the car with is speeding up while those ahead of us are braking. Freaks me out. I wish I had a answer for why those schmucks are let back in after driving down the breakdown lane to get ahead of everyone else. You wouldn't let them do that in line at the grocery store so why on the road? Aw... Bicycle lanes! I miss those. Bravo for you! It's just not cool to try to cut in like that, and it actually kind of surprizes me that people attempt it. I mean, it's not like you're going to get there any faster... Especially after you've pissed off the entire lane of traffic that you're trying to cut into. As for using 95 and 15, OMG! I used them All the time! But then, they were always the most direct (and quickest) route to where I was going. I'm a traffic Nazi. If somebody tries to cut in front after pulling a stunt like that they've got two options -- wait for a car *other* than me to let them in or ram right into my car. No way I'm lettin' you in! What the hell, man! Where in Vegas do you live? I'll be there next weekend!! It's funny you bring this up; I passed you on the 95 yesterday afternoon (your bumper sticker was a dead giveaway). It was just too congested to roll down my window and make faces at you! When I used to drive a big truck, I did the same thing - take up the shoulder or the ending lane so idiots couldn't get by. Once in awhile I get brave in my itty-bitty Tuscon. Jenn: I live right around the Rainbow curve (U.S. 95 & Rainbow.) But spend way too much time at the big green hotel. Lily: I was actually thinking about the store analogy. Even though, there is the rare time that you have two carts of groceries and you let someone with 1 item jump in as you unload. Vavoom: I can really understand the traffic Nazi urge. It's hard to supress. RT: No bicycle lanes near you? Tell me they at least have a Best Buy there. Nope, no bicycle lanes here, we don't even have breakdown/emergency lanes, so trying to ride a bike in town is very dangerous. There is a bicycle trail that runs along the river, but it's not very practical if you want to ride to work. The nearest Best Buy is 30 minutes away (and that's not on a bike.) As is the nearest bookstore (except for the crappy little one at the "mall" if you can call it that.) I'm telling you, I've been spoiled, lol. You wouldn't believe how excited I was when we got our first coffee shop a few months ago! I have so many traffic pet peeves I do not know where to begin. Yes I do the same thing you do, by staying in between the two lanes not letting people pass me just so they can get to their destination 2 minutes fatser. However, when I see that a person has no choice but to merge lanes, I always let them go. I really hate it when they know you have not choice because of construction (which is always going on in this town) and people speed up so you cannot merge lanes. Jenn I agree with you, if I go out of my way to let someone merge, they better say thank you, if not I am really annoyed. Yes I do not know how many times I have driven beside your car and you just don't notice me, it is ok I got over it a long time ago :) I do drive about 10 miles above the speed limit, unless it is on 215 which is my new route to work then I go about 20 miles above the speed limit, just waiting for the day when I get my first speeding ticket.